Carratraca Malaga - Getting from Malaga airport to Carratraca. Carratraca is a municipality situated between the Ronda mountain range and Antequera, although it actually belongs to the region of Guadalteba. 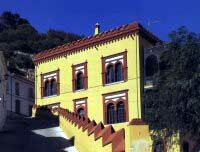 Its strategic situation with nearby villages such as Alora and Ardales, favoured the presence of inhabitants since Ancient times. The historical centre of Carratraca has been declared asset of cultural interest. This old quarter was formed due to the popularity that the sulphurous water spa achieved. There have been found Neolithic remains and cave paintings, as well as roman coins and a necropolis near the ‘Arroyo de las Cañas’. Carratraca has a huge history that is shared out along many centuries over the passage of time, from the prehistoric period until our time, with a considerably important cultural legacy. The origin of this municipality dates back to the 19th century, according to writings that have reached our days. In the past, there was only one house known as the ‘Cortijo de aguas hediondas’ (Country house of the foul-smelling waters), but there were remains of tombs and ceramics all around the village, as well as a wall...which is why it is assumed that the town was inhabited and abandoned for unknown reasons in the past. Carratraca’s origin is linked to the spring of sulphurous water whose healing properties drew the attention of the romans and is undoubtedly a more than recommendable place to visit. Due to the interest of the romans in this spring, today we have four stone baths. There is hardly any information on the presence of the Arabs. The sulphurous water spa is a must visit, with a neoclassical style. Other places of interest are the 'Cuevas del Duende' (the Elf’s caves) and the Necropolis. The town hall building, with a neo-Arab style, is a great tourist attraction to take some beautiful pictures, as well as the small polygonal-shaped bullring, excavated in the rock. Amongst the most special and traditional festivities in the region, it’s well worth mentioning the enchantment of the Moorish Moon festival on the first weekend of September, that reminds us of the Andalusian cultural legacy transporting the visitors back to the past where several different cultures coexisted. Another festivity is the celebration of the ‘Semana Santa’ (Holy Week), where hundreds of locals act out to stage the passion. In Carratraca we’ll be able to buy tools made with esparto and wood, as well as iron and forge. It’s a great place to take a wonderful, typical souvenir of the Malaga villages with us. Carratraca’s gastronomy is complete and based on pork and kid; amongst the most outstanding dishes and desserts we’ll find the sponge cakes, the olive oil and almond flat tarts, Callos (tripe) and the Chivo a la Pastoril (Pastoril-style kid). Carratraca is situated 50 Km. away from Malaga airport (about a 50 minute drive by car). You must follow the road towards Cartama and Pizarra, Carratraca is located just before Ardales. Town council: Avda. Andalucía, 52.